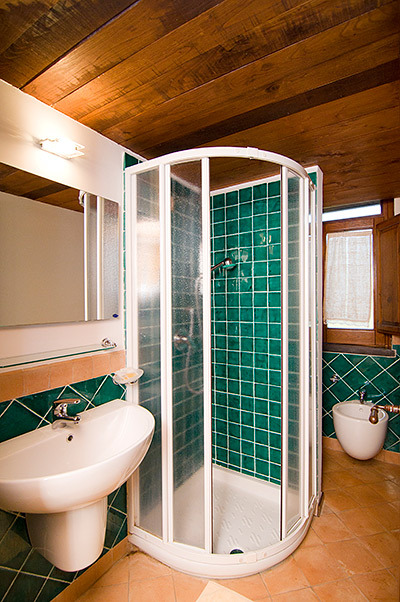 A comfortable in a country style decorated flat located on the upper floor of the Locanda. From the terrace it is possible to admire the old village with the characteristic houses surrounding the white and high church bell tower, on the left the breathtaking Cilento coast, from Casal Velino to Capo Palinuro. Among the numerous options our guests have to make their holiday a memorable one, they can spend relaxing day on the side of a blue water swimming pool, furnished with sun umbrellas and sun beds; you can enjoy a romantic dinner on the panoramic terrace of the restaurant tasting the delicious dishes of the Mediterranean cuisine accompanied by a wide choice of wines. The Orange Apartment is furnished in a country style, with stonewalls, floor in terracotta tiles and wooden furniture. It's equipped with air conditioning and a beautiful terrace in order to guarantee the maximum comfort. It can host a maximum of 3 people and is composed of a kitchen, a double bedroom, a bathroom with a shower unit and a small loft with a couch. Extra services: final cleaning (upon request), weekly linen change, sat tv, swimming pool linen and private parking area. The center of Casal Velino can be reached by a short walk, while the beaches of Marina di Casal Velino are 5 minutes away by car. The position is ideal to visit the most attractive destinations: Velia archaeological ruins (5km), the temples and archaeological ruins of Paestum (20km) Mediterranean Ancel Keys Diet Museum in Pioppi(5 km) and the fisherman villages of Acciaroli, Palinuro, Marina di Camerota. Moreover, during summer time there also is the Metrò del Mare, an hydrofoils connection service that allows to reach in about one hour Capri, Amalfi and Sorrento. Any additional information you may require will be provided upon arrival by the hotel staff.